This is a great chart to help stretch out introductions. 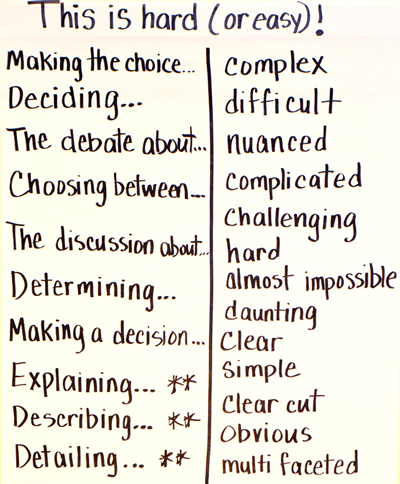 When students prepare to argue a point, they commonly create thesis statements that name their points in one sentence. When students do this, they end up with nothing much left to write in their introduction. We encourage them to provide context, background, or hook their readers in this space. While these are all viable options, the introduction still seems short. One way to tackle this is to have students begin with a this is hard or this is easy statement. This type of sentence works will with argument writing because it either acknowledges the complexity of a topic (which should be the case with an authentic topic) or implies that it is such a simple choice (setting up the stance that the author has a pervasive and clear argument). I begin by discussing topics that the majority of my students would choose similar sides for. For example, should the driving be moved to 21? Anything regarding rights for students or person freedom typically works well. Then I shift and we talk about more nuanced topics. Ideas of whether certain classes should be offered, certain parts of the school budget cut, or deciding who is the smartest person in the building is are common directions that I have gone in. After discussing these I ask if these were more complex. Once students come to the idea that some topics are easy to make, while others are more complicated, I tell them that this is a great way to start an argument. “Let your reader know the weight of your content from the start. Then, go into naming your claim, counterclaims, and reasons. This builds up your topic and gives you a bit of length without giving away your points at the first sentence. Then, I create the chart and we practice writing sentences using the different synonyms. I love this idea! Creating an intro that includes a hook and a thesis statement can be tricky for students. Could you explain how you use both sides of the chart? How do your students pull from the anchor chart to create their introduction (particularly the second column)? Typically students are either writing to prompt or writing about a specific topic. I have them restate the topic or prompt in between the two columns. For example, if the writing stimulus is to explain the differences between Venus and Jupiter, students might write: Describing the differences between Venus and Jupiter is simple. Let’s say that students were supposed to write a bio on George Washington. They might write: Detailing the life of George Washington is complex. Explaining the events in George Washington’s life is straightforward. Whatever the topic is can be dropped right in the middle to basically explain that the topic or prompt is easy to discuss or difficult. Leave a Reply to Kaitlyn Click here to cancel reply.